In 1861, Doctor Richard Gatling patented the Gatling Gun, a devout pacifist, invented a six-barreled weapon capable of firing a (at the time) phenomenal 200 rounds per minute. 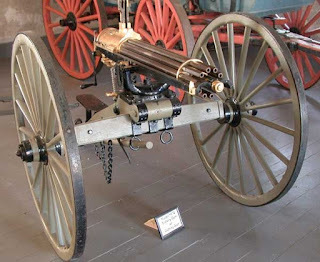 When Gatling created his gun during the American Civil War, he sincerely believed that his invention would end war by making it unthinkable to use due to the horrific carnage and loss of life that would be possible. 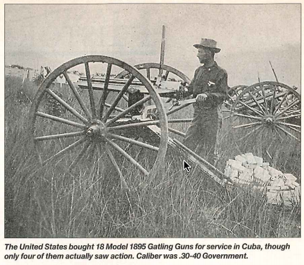 The Gatling gun was a hand-driven, crank-operated, multi-barrel, machine gun. The first machine gun with reliable loading, the Gatling gun had the ability to fire sustained multiple bursts. The 1862 version of the Gatling gun had reloadable steel chambers and used percussion caps to ignite the gunpowder. It was prone to occasional jamming. In 1867, Gatling redesigned the Gatling gun again to use metallic cartridges – this version was bought and used by the United States Army.